Going to the cottage this weekend to play bubbles with my grandson. How cute is this digi stamp by Mo Manning????? Just perfect for my little cupcake. This is precious! 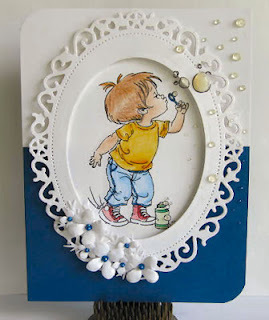 I love that gorgeous frame and how you brought the bubbles outside of it. Cute effect! Thanks so much for joining us this week at Mo's!